The powerful feature set of the Ascolog Insight log viewer and parser helps you to understand your software system. Here is an overview of the features. The program uses optimized algorithms to achieve unmatched processing performance even with very large logs. 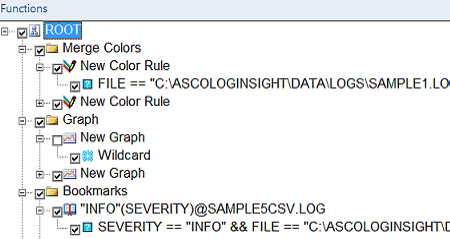 Ascolog Insight is not only useful for analyzing log records but also for analyzing data provided in the CSV format. A common use case is to export the data of spreadsheet applications like Microsoft Excel® or OpenOffice Calc to a CSV file and to analyze it with Ascolog Insight. 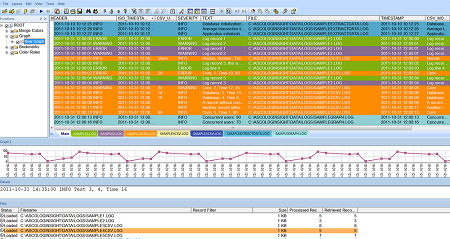 Ascolog Insight is very flexible when it comes to analyzing log records of different formats. It can be adapted so that it "understands" the format that is used by a certain type of log record. When Ascolog Insight does not already know the log format there is a wizard that helps you to adapt Ascolog Insight to the new log format. You can analyze a wide range of log formats, e.g. XML based log files, logs without any special markups, logs created by the Apache logging services (log4j, log4net), Syslog, Microsoft Windows Event Logs. Ascolog Insight supports log records that span multiple lines. Ascolog Insight supports the merging of logs originating from different sources (files). All logs can be displayed in a single scrollable view without the need to switch between views or pages to see a certain log record. Log records from different sources can be easily distinguished by their color in the log view. The user can configure a default column which is used to define the order of the log records from the different sources in the merged log (e.g. to order by time stamp the time stamp column is chosen). Coded information can be decoded and will be presented in a more understandable form: e.g. the term ERROR is displayed instead of a number representing an error. This means that the size of log files can be reduced. However, they won't lose their readability. You can easily search your open logs and Ascolog Insight also offers a Find in Files search function. Ascolog Insight can be run as a Windows® service. An SDK to adapt Ascolog Insight to your needs is also available. The SDK allows access to any kind of data source (e.g. binary files, databases, cloud storage). Note: Ascolog Insight Professional does not include the Ascolog Insight SDK and Ascolog Insight Professional cannot be run as a Windows® service.